Mathematics is a very popular area of study in the U.S. International students interested in mathematics can find many great places to study. Along with being an interesting subject to study, a degree in mathematics can lead to many excellent career opportunities in the future. Mathematics is a thriving field of research in the U.S. It is an area of study that can appeal to those with either theoretical or applied interests, or both. International students interested in a career involving mathematics can greatly benefit from studying math in the U.S. But math is not only for mathematicians or math teachers. There are many different careers for which knowledge of mathematics is useful. Also, mathematics can useful for everyday activities outside of the workplace. Here is some information for international students who are thinking about studying mathematics in the U.S. It is not easy to provide a definition of mathematics that is both general and complete. One rough description is that mathematics is the study of abstract relationships among numerical quantities, sets, and geometric shapes. Courses in mathematics include various forms of calculus, algebra, geometry, trigonometry, and set theory among other topics. Mathematics proceeds deductively; mathematicians try to prove their conclusions with certainty. While lower-level classes often assign students exercises where the student needs to execute mechanical rules to arrive at the correct conclusion, as students become more advanced, they will be expected to complete proofs and derivations of their own to show some conclusion regarding mathematics. Those who enjoy puzzle solving or detecting patterns might be particularly interested in more advanced mathematics. Mathematics is a very popular area of research in the U.S. and for good reason. Knowledge of mathematics is helpful in many different ways. Some international students might be interested in complex theoretical questions about the nature of numerical reality and mathematical cognition. Many others are interested in teaching math and its uses to others. Math skills are indispensable for many different disciplines and areas of work, such as engineering, physics, economics, accounting, and many others, and so studying mathematics is an essential part of their education. Finally, knowledge of mathematics is useful in everyday life, such as managing a budget, working on home projects, and much more. There are countless reasons to study mathematics. 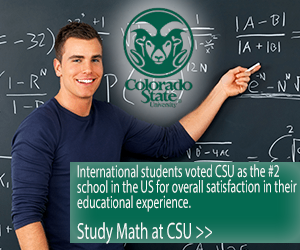 There are many great places for international students to study math in the U.S. Many of the best universities have excellent mathematics departments as well. For instance, Felician University	offers students a Mathematics curriculum that is designed to prepare students for careers in various professions including statistics, business, insurance, computer science, education, actuarial science, and operations research just to name a few. Mathematics majors from Felician University graduate with the ability to reason critically and logically through problem solving and finally communicate these and other findings effectively through oral and written presentations. Additionally, Massachusetts Institute of Technology, Harvard University, and Stanford University all have top ranked mathematics departments. These are among the very top schools, but students will receive a great education from many different schools. It is important to keep in mind that, like all rankings lists, there is a degree of subjectivity involved in the ranking and the top schools on the list are not necessarily the best fit for your personal needs and abilities. Students are encouraged to investigate thoroughly into schools they choose to attend and to keep in mind that prestige is not the only important factor in deciding where to study mathematics. Studying math in the U.S. can lead to many fulfilling careers in the future. International students with a degree in mathematics can go into many different areas of further research or to many different sorts of careers. The skills one learns in mathematics apply to a broad range of areas. For instance, engineers, architects, computer software engineers, construction workers, physicists, statisticians, accountants, logicians, and many other careers all utilize principles of mathematics. This is only a small sample of the many fields in which a degree in mathematics can pay off. Great skill with mathematics is a highly prized quality that few can attain, and so there is virtually always a demand for someone that fits this description.